This lesson serves as a guide to the OEAA Assessment Component of the Michigan Student Data System submission. The Math Test Type is drawn from the "Math Test Type" field under the Students Tab-> OEAA Assessment link. The Math Group Code is drawn from the "Math Group Code" field under the Students Tab-> OEAA Assessment link. The Math Research Code 1 is drawn from the "Math Research Code 1" field under the Students Tab-> OEAA Assessment link. The Math Research Code 2 is drawn from the "Math Research Code 2" field under the Students Tab-> OEAA Assessment link. The Reading Test Type is drawn from the "Reading Test Type" field under the Students Tab-> OEAA Assessment link. 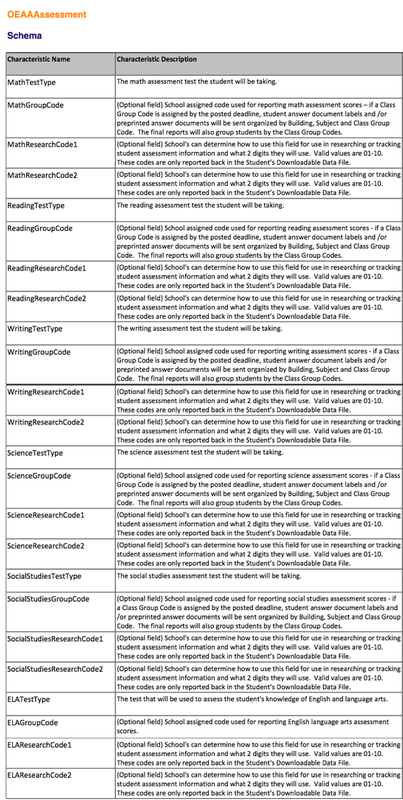 The Reading Group Code is generated from the "Reading Group Code" field under the Students Tab-> OEAA Assessment link. The Reading Research Code 1 is generated from the "Reading Research Code 1" field under the Students Tab-> OEAA Assessment link. The Writing Test Type is generated from the "Writing Test Type" field under the Students Tab-> OEAA Assessment link. The Writing Group Code is generated from the "Writing Group Code" field under the Students Tab-> OEAA Assessment link. The Writing Research Code 1 is generated from the "Writing Writing Research Code 1" field under the Students Tab-> OEAA Assessment link. The Writing Research Code 2 is generated from the "Writing Writing Research Code 2" field under the Students Tab-> OEAA Assessment link. The Science Test Type is generated from the "Science Test Type" field under the Students Tab-> OEAA Assessment link. The Science Research Code 1 is generated from the "Science Research Code 1" field under the Students Tab-> OEAA Assessment link. The Science Research Code 2 is generated from the "Science Research Code 2" field under the Students Tab-> OEAA Assessment link. The Social Studies Test Type is generated from the "Social Studies Test Type" field under the Students Tab-> OEAA Assessment link. The Social Studies Test Code is generated from the "Social Studies Test Code" field under the Students Tab-> OEAA Assessment link. The Social Studies Research Code 1 is generated from the "Social Studies Research Code 1" field under the Students Tab-> OEAA Assessment link. The Social Studies Research Code 2 is generated from the "Social Studies Research Code 2" field under the Students Tab-> OEAA Assessment link. The ELA Test Type is generated from the "ELA Test Type" field under the Students Tab-> OEAA Assessment link. The ELA Test Code is generated from the "ELA Test Code" field under the Students Tab-> OEAA Assessment link. The ELA Research Code 1 is generated from the "ELA Research Code 1" field under the Students Tab-> OEAA Assessment link. The ELA Research Code 2 is generated from the "ELA Research Code 2" field under the Students Tab-> OEAA Assessment link.